This sermon was preached at Asbury United Methodist Church in Livermore, CA on Pentecost, June 12, 2011. The lectionary texts I used in the sermon were Acts 2:1-21 and Numbers 11:24-30. The Holy Spirit shows up and creates a problem. That’s what the video said earlier as we began our time of worship on this Pentecost Sunday. That’s probably not the typical message that you would assume to hear on Pentecost Sunday. Maybe it would be something about the power of the Holy Spirit, maybe talking about the tongues of fire resting on people’s heads, or maybe we’d take a step back and talk about the Body of Christ, and how the Spirit has given us all different and unique gifts, and how we should all use our gifts together for the betterment of the Body of Christ. And we may touch on some of that this morning – but when I read these two passages – and when I watched the video that we started the service with – it’s hard to not agree that the Holy Spirit shows up and creates problems. The Day of Pentecost occurred 50 days after Passover and Easter and coincided with the Jewish harvest festival, Shavuot, which is when the Jewish people commemorated the giving of the 10 Commandments. As these early Jewish followers of Jesus came together to give thanks for the 10 Commandments, they were clearly in for a surprise. They came together for yet one more festival integral to their faith, something that was expected, planned and something they were used to doing…and then the Holy Spirit shows up. All of a sudden, people are speaking in many different languages and there is chaos. As we read in the text, Jews from every nation under heaven living in Jerusalem were amazed and astonished that Galileans were speaking their native languages. It didn’t make any sense…we know things must chaotic, because others assumed Shavuot had gotten a little out of control and everyone must have had a little too much to drink. They’re drunk! There’s no other explanation for this craziness. Or maybe there is…Peter steps up and begins to explain. We don’t know if the disciples all put their heads together and realized that what was happening was similar to a prophecy from Joel, or whether Peter had just done a quick search on his pocket scroll for the word “Spirit” in the Hebrew scriptures – but he quotes from the prophet Joel about how God is going to pour out God’s spirit upon all flesh…and crazy stuff is going to happen. I’m not sure I’ve read this story from Numbers before. I mean – I must have read it at some point in seminary – but this time around, something really stuck out to me that I’ve missed before. Earlier in Chapter 11, things are just not going well for the Israelites. They’re upset, they’re complaining…and that upsets God and…God sets fire to part of their camp. The Israelites weep, they get angry again, which gets God angry again, and Moses finally says that he can’t deal with all of these people by himself. It’s just too much. Luckily, God has a plan. God tells Moses to bring together 70 men from the elders of Israel, and God will take some of the spirit that is on Moses, and basically spread it out among the 70 as well, so that they all will bear the burden of dealing with God’s chosen people. That’s the plan that we hear from God. Bring me 70 men – and I’ll give them the spirit. And initially, that seems to be what happens. God shows up, the spirit rests on the elders and they prophesy. But only once. Because then things get a little crazy: the spirit seems to have a mind of her own, and proceeds to go and rest upon Eldad and Medad. And of course, since it wasn’t initially part of the plan, people started to get upset. Why was the spirit resting on these two? They’re prophesying?! It wasn’t supposed to be like that – the 70 elders were supposed to be the ones to get the spirit. Certainly from these two stories alone – we know one thing about the Holy Spirit – you can’t control her. She moves in whatever mysterious ways she wants. Whether we’re talking about the Greek word for spirit, pneuma, which means breath, breeze, or a current of air, or the Hebrew word, ruah, which means breath, wind or spirit…neither of these words describe something that you can very easily control or grasp onto. In the Celtic tradition the Holy Spirit is represented as a bird, but not the peaceful and serene dove landing on Jesus at his baptism. For their symbol of the Holy Spirit, the Celtic church people chose the Wild Goose. Why did the Wild Goose speak to those ancient Celtic Christians? To begin with, wild geese aren’t controllable. You can’t restrain a wild goose and bend it to your will. They’re raucous and loud. Unlike the sweet and calming cooing of a dove, a goose’s honk is strong, challenging, strident and unnerving – and just a bit scary. In much the same way the Spirit of God can be, demanding and unsettling. Think about the story of Pentecost, and the impression the disciples made on the crowd. People thought they were drunk and disorderly! Its one thing for a gentle dove to descend peacefully on Jesus – it’s something all together different when the Spirit descends like a wild, noisy goose! Last Tuesday night I stood in O.co stadium with almost 70,000 other people, and found the Spirit present. Nearly 70,000 people heard a message of peace and love and justice. We prayed and sang for those suffering oppression, we rejoiced for those who have been freed from injustices…we recognized those who work for justice in our world. And all of this happened at a U2 concert. As Bono himself sings, the Spirit really does move in mysterious ways. And I’m sure that some of you have had moments when the Spirit has shown up unexpectedly. Whether it was at a U2 concert, when you were out in nature, in the middle of a conversation with a close friend…the Spirit shows up when we are least expecting her. And so on this Pentecost Sunday – on one of the few Sundays that the Holy Spirit actually gets emphasized in our churches – I believe we are challenged by these scripture passages and by the image of the divine wild goose, to be open to the mysterious and even bizarre ways in which the Spirit works. I think we are reminded to not be like the young man running through the camp to Moses and complaining that Eldad and Medad have ALSO received the Spirit. I think we are reminded to not think people are drunk just because something a bit bizarre is happening. I believe one of our callings as people of faith is to always be seeking ways to widen our hearts. When we widen our hearts, we realize that the Spirit is present in more people than we had thought before. When we widen our hearts, we begin to notice God working in places that we didn’t before. 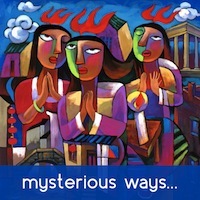 When we widen our hearts, our eyes are opened to the mysterious ways in which the Spirit moves in our world today. May we find ways to open ourselves up to the movements of the Spirit today. AMEN. « What!? You’re not using WordPress? Great post! I was excited to see that our children’s ministry did a message on Pentecost, and when the kids came out asking their parents what today was, no one knew! Glad the kids are teaching the adults in our lacking-liturgy church. As a side note, whatever media was embedded was flash dependent, so not viewable on iOS! i’m interested in knowing the source of the image you used in this post. Help? I love this guy’s art, I create the weekly bulletin for my church and use his artwork frequently.